The 3rd Annual Rural Action Adventure Auction is coming to the Hocking College Student Center on April 24, 2010 from 6:00-10:00 p.m. This promises to be a fun-filled evening with silent and live auctions featuring adventure-themed packages from our region and beyond. The adventure continues throughout the night with live music by local jazz trio Las Cuerdas, dinner by Purple Chopstix and Salaam, regional microbrews and wine, and a photobooth so that you can capture the magic of the evening. Pat Sheridan, of Shamrock Auction services has generously agreed to donate his services as auctioneer again this year. Donations continue to roll in and we have many exciting items so far, including a one-week stay in a tres chic Parisian apartment, one-of-a-kind dinners hosted by community members, wellness packages, concert and music festival tickets, and much more! For more information about the event and to purchase tickets, please visit: http://www.adventureauction.org/ or call 740-767-4938. To get you in the spirit, each week leading up to the auction, we will feature a new Tale of Adventure highlighting the amazing escapades experienced by some of last year's highest bidders. 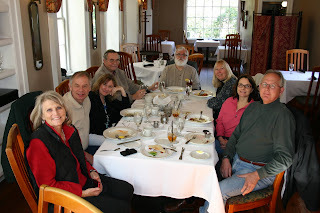 The Potato Creek Adventure Package was donated by Carol and Bruce Kuhre amd our first adventure story is about a group of friends who spent a week at Potato Creek Cottage in South Carolina. Earlier this year, David & Jeannie Heaton, Michael & Sheila Mark, Ron & Cindy Birt, Kelli Bell and John Kotowski spent a week at a three bedroom cottage where Potato Creek empties into Lake Marion in South Carolina. Lake Marion is the state’s largest man-made lake, and is located between multiple state and national forests. Read-on for an account of John’s adventure written by himself. “The adventure began ominously, with off and on rain on Sunday. We were able to get out on the lake because Carol and Bruce Kuhre offered to take us out on their boat. Unfortunately, the ride was cut short because it started to rain rather hard. This led to us returning to the house and drying off. To help us warm back up, we started a fire in the fire place. It became evident quickly that the cottage is inviting and the fire place is a real strength and focal point for activities that we involved ourselves within the home. 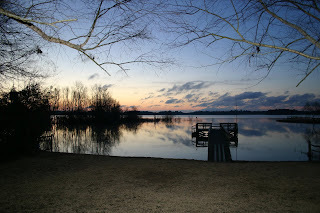 “Thursday started with a beautiful sunrise over Potato Creek Lake. The sky was clear all night and the sun was strong all day. The entire group went over to Charleston for the day. We explored Market Street and started a walking tour of the city. About noon, we found a wonderful restaurant on Queen Street (http://www.82queen.com/news/). It is nestled in an older building, and features a lovely outdoor dining area. This place is one I highly recommend, and if you find an opportunity to dine there, the crab soup is a must have. “Friday morning Kelli and I headed east to the Francis Beidler Forest, which is owned in part by the Audubon Society . Kelli and I arrived at the swamp about mid-morning. This is a spectacularly beautiful and serene place. It contains about 1,700 acres, and is the largest remaining virgin stand of bald cypress and tupelo trees in the world. We spent much of the morning and into the early afternoon at Beidler Forest and then took off for the Middleton Plantation, where America’s oldest formal landscaped gardens (c.1741) rise from the river in sweeping terraces, at the foot of which is a pair of butterfly lakes (click here to see more). Intricate walks, vast plantings of camellias, azaleas, roses and magnolias accent the French and English landscape designs. “This trip was truly a special adventure. We were exposed to such a broad range of experiences and had some wonderful time together with friends. The cottage was wonderful and we were welcomed and treated so well by its owners. Looking back on the trip, we did so much. We went to Charleston, spent time at Moncks Corner, Middleton Place (a plantation), Summerville, Beidler Forest, Santee State Park Santee National Wildlife Refuse, as well as some quality time at the cottage talking and laughing around a fire. We were able to get out on the lake a couple of times, both on a pontoon boat and in a canoe, and made some wonderful meals in the cottage together. A wonderful, adventurous time was had by all. 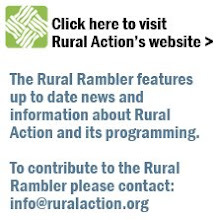 Stay tuned to the Rambler for more stories from last year’s Adventure Auction winners!